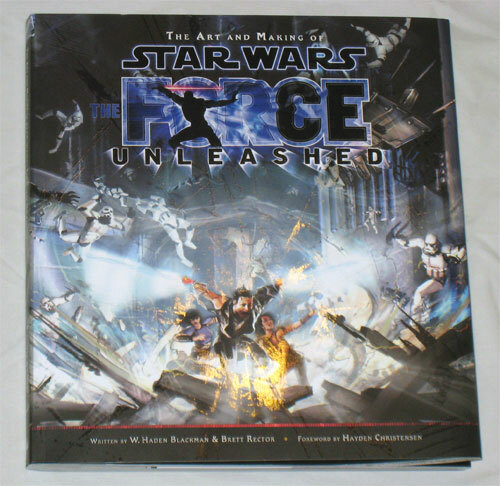 Over the weekend I bought the book, “The Art and Making of Star Wars: The Force Unleashed“. As you’ve probably already heard, “Star Wars: The Force Unleashed” is LucasArts latest multimedia event. While there have been tons of Star Wars products that go beyond the movies, there are rarely items that get the full support of the Lucas-related companies (LucasFilm, LucasArts, LucasToilet, etc). There are only two other events of this scope I can think of, “Clone Wars” and “Shadows of the Empire“. The story of “The Force Unleashed” (TFU) follows Darth Vader’s Secret Apprentice during the years between the films “Revenge of the Sith” and “A New Hope”. At the center of TFU is a new video game that took four years to develop and involved substantial collaboration between LucasArts and ILM. While I’m not a gamer, I’ve seen some of the game play from the demo and was seriously impressed. Others I know have had issues with the inconsistency of the characters powers during the demo (i.e. He can levitate a TIE fighter but not an AT-ST), but I haven’t heard any feedback since the full version of the game was released. and a behind-the-scenes book covering the development of the video game (see below). The book I purchased, “The Art and Making of Star Wars: The Force Unleashed“, is a beautiful 168 page book that covers the development of TFU video game. This includes the original concepts, new characters and settings, developing new Force powers, pitching the ideas to George Lucas himself, a focus on cutting-edge game play, and much more. Also worth mentioning are the unused game concepts and more than 300 pieces of conceptual artwork used during development. We’re not talking screenshots of the game, these are fully painted images representing the story. In an effort to enhance the book, the publishers included some fold-out pages as well as two pockets that contain 10 Character Cards covering key figures in the story. Another neat feature of the book is the “spot varnish” effect they put on the cover to represent the power “Force Repulse”. This is essentially “Force Push” but amped up to create a violent radial shockwave of kinetic Force energy. See the two photos below. The first is simply the artwork from the cover. 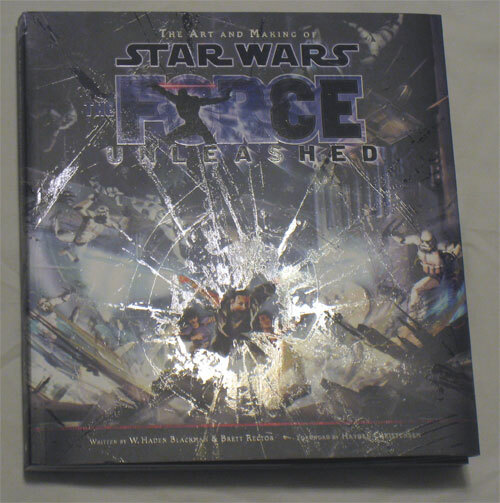 The second was taken in an effort to highlight the really shiny varnish on the cover that gives the “Force Repulse” effect. The pictures don’t do it justice; it looks really cool. I mentioned before that I’m not a gamer, however, I am interested in TFU story and its development. I’ve read 100 pages of this book and I’m having a hard time putting it down. So far the book has been less about video games and more about the development of the plot and characters. This is the stuff I find fascinating. My background is in Marketing, so the development process for products is always interesting to me. They were developing plots for this game back in 2004, before “Revenge of the Sith” had even been released. One of the unused original story concepts was “Star Wars: Underworld” in which the main character would be a smuggler type dealing with the ugly side of the Star Was universe (think Han Solo before he became a Rebel). Another of the original story concepts was “Jedi Outlaw” set in the far future where the Jedi and Sith have formed an alliance, and the last Skywalker is on the run because he was framed for a crime he didn’t commit (somewhat similar to the “Star Wars Legacy” comic which came a few years later). The ideas discussed come to life with the gorgeous concept art throughout the book. This is a great book and I highly recommend it to any Star Wars fans. If you are skeptical, keep in mind this is coming from someone who doesn’t really like the prequels or video games. If I can enjoy this book, I think anyone could. Be warned, reading this book does reveal several plot points from TFU. So if you are looking to avoid spoilers, come back to this book after you’ve finished the game, novel, or comic book. Finally, if you like this book, you might also enjoy, “The Secrets of Star Wars: Shadows of the Empire“. 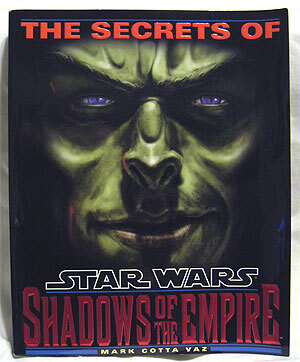 While it’s not as flashy as this book, it does cover the development of the multimedia event “Shadows of the Empire”. It’s a good read. if i buy this book and read it and it blows….well let’s just say that will be ANOTHER one you owe me.